Due to the challenging topography of the Ozark Mountain Range in Northwest Arkansas you need a concrete wall contractor with experience as well as expertise in site planning and layout. 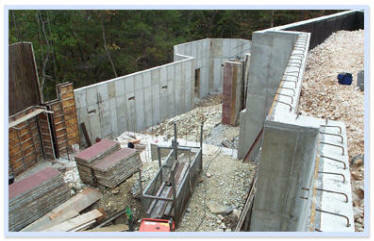 We take pride in the ability to build quality foundation assemblies on adverse terrain. Our familiarity with the soil conditions of the area helps ensure that each foundation assembly that is constructed is properly suited to its site conditions. For more information or to set up an appointment for your next cast in place concrete project contact us today!